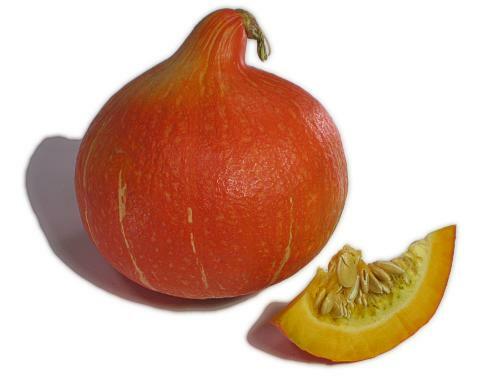 General Information: Also known as a Japanese squash, Orange Hokkaido or Uchiki Kuri squash, this fruit is commonly known as the Kuri squash. Medium sized and round with a tapered end, this is a thick-skinned, orange colored squash that looks like a pumpkin with a topknot and without the ridges. Its deep orange-colored shell reveals a mild flavored flesh with a somewhat dry texture. The firm flesh provides a very delicate and mellow flavor similar to the taste of chestnuts. Under its deep orange shell is mild flavored flesh with a somewhat dry texture and a delicate, subtle flavor similar to chestnuts. All Squash are members of the Cucurbitaceae family and are relatives of both melons and cucumbers. Applications: Bake, boil, steam, or microwave, can be pureed or mashed; top with butter, herbs, cinnamon, or brown sugar. Serve as a side dish or use as a base for soups.